Customers now have the ability to add multiple phone numbers and email addresses to individual contacts using our brand new Contact Labels. We’ve had several requests for this brand new option and it’s officially launched with our latest iteration of DialMyCalls. You can now have a single contact with labels such as: main, mobile, work, secondary, and many more. Managing your contacts and sending voice and SMS broadcasts to multiple numbers from within DialMyCalls has never been easier! Let’s take a quick look at how you can set up and manage contact labels with DialMyCalls 3.0. Above Image: Add multiple phone numbers and emails to individual contacts with our brand new labels. There are a couple ways in which you can create labels in your DialMyCalls account. First and foremost, labels are by request only so you will need to contact us to enable them on your account. Once enabled, the first method to create new contact labels is by adding an individual contact to your account. From the “Contacts” tab, click on the “Manually Add” option to get started. Above Image: Add individual contacts to your account. By default you will already have the label “Main” created which you will see in the dropdown under “Phone Numbers”. 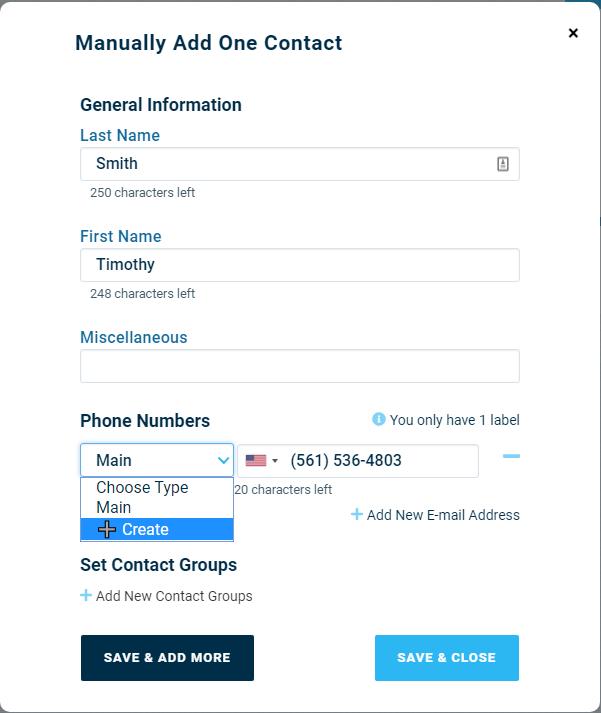 While adding your new contact, you will also notice “+Create” is an option and if you click on that then you will be able to create a new contact label. 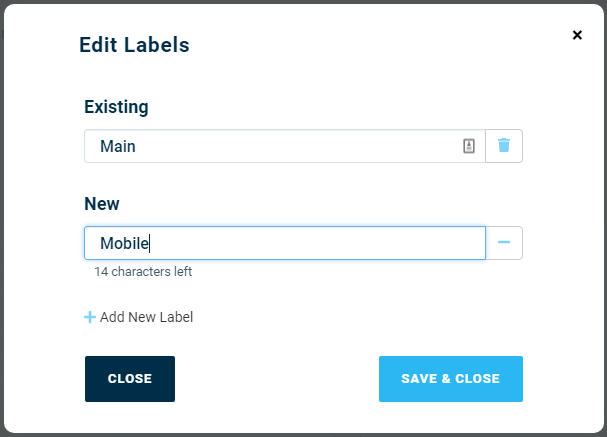 Above Image: Create a new label when adding an individual contact to your account. Once you click on “+Create” you will now see the “Add A Type” pop-up window. 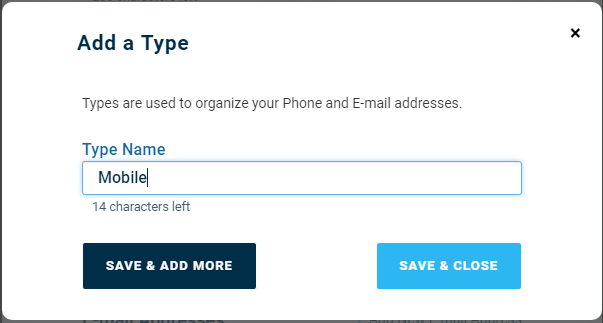 Go ahead and type out the new contact label that you would like to add to your account – this can be named anything you’d like and it will create that label for both phone numbers and email addresses in your account. Above Image: Name your new contact label to add to your account. Once your label is created, you will now be able to add multiple phone numbers and emails to an individual contact. You no longer have to have multiple contacts with the same name because they have different phone numbers – contact labels allow you to have one contact with multiple numbers. Above Image: Add multiple phone numbers and email addresses to a single contact using labels. Are you contacting hundreds if not thousands of contacts? If you plan on only uploading contacts into your account and will not be adding them individually then we have a secondary method for creating and managing Contact Labels. Once logged into your account, click on the “Contacts” tab and then “Groups”. From the “Groups” tab you will see an icon under “Add Group” on the right-hand side of your screen – click on that icon to open up our contact management menu. Above Image: From your “Contacts” tab, click on “Groups” and then click the dropdown menu to the right. In the contact management menu click on “Edit Labels” to create a new contact label or edit exiting labels if you have already created them. Above Image: Click on “Edit Labels”. 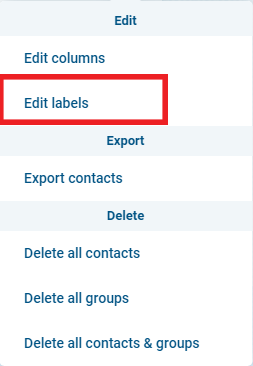 Clicking on “Edit Labels” will show you the existing labels in your account and allow you to add brand new Contact Labels as well- labels are able to be edited and/or deleted once created. Above Image: Add new labels to your DialMyCalls account. Uploading a list of contacts into DialMyCalls is quite simple and now customers of our service can take full advantage of our Contact Labels when importing a spreadsheet of contacts. From the “Contacts” tab, click on “Upload List” and then select the spreadsheet (.CSV, .XLS or . XLSX) to upload. Above Image: Upload contacts into your DialMyCalls account. Upon selecting your spreadsheet of contact to upload into DialMyCalls, you will see the “Upload Contacts” preview window. Customers will now assign the data being imported using the dropdown menus above each column. The Contact Labels now allow several columns of numbers and email addresses to be assigned to a single contact – simply click above each column that contains a number and assign it to one of the labels in your account – it’s really that easy! Once you have assigned all of the contact information, you are able to upload the contacts into your account or create contact groups to upload them into. Above Image: Select the proper contact labels for your uploaded spreadsheet to add them to your account. You’ve created Contact Labels and added all your contacts into your DialMyCalls account, what do you do next? It’s now time to set up a broadcast to go out using version 3.0 of our mass notification system. Simply click on “New Broadcast” and then select the type(s) of broadcast you’d like to send to your contacts. Customers have the ability to send a phone call, text message or email broadcast – email broadcasts are only available when sending a voice or text broadcast, you cannot send an email by itself. Above Image: Send out a phone call, text message and email broadcast to all contacts at the same time. 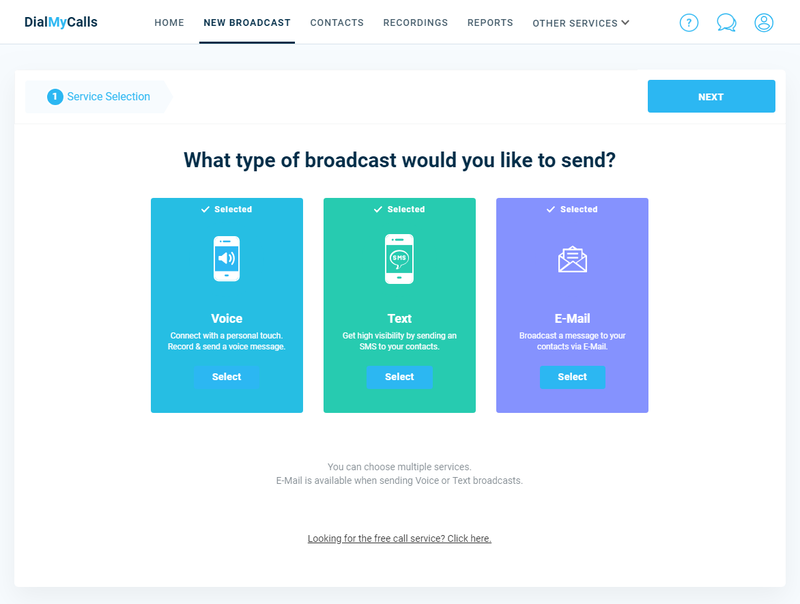 During step 2 of the new broadcast process, please select the contacts that you’d like to send your voice broadcast, SMS broadcast and/or email broadcast out to. You will visually see all of your contacts as well as the Contact Labels associated with them. Once you’ve selected your contact, click on “Next” to proceed to step 3. Above Image: Select your contacts that contain multiple numbers to send a broadcast to. Step 3 of the new broadcast process will have you “Select Labels”. 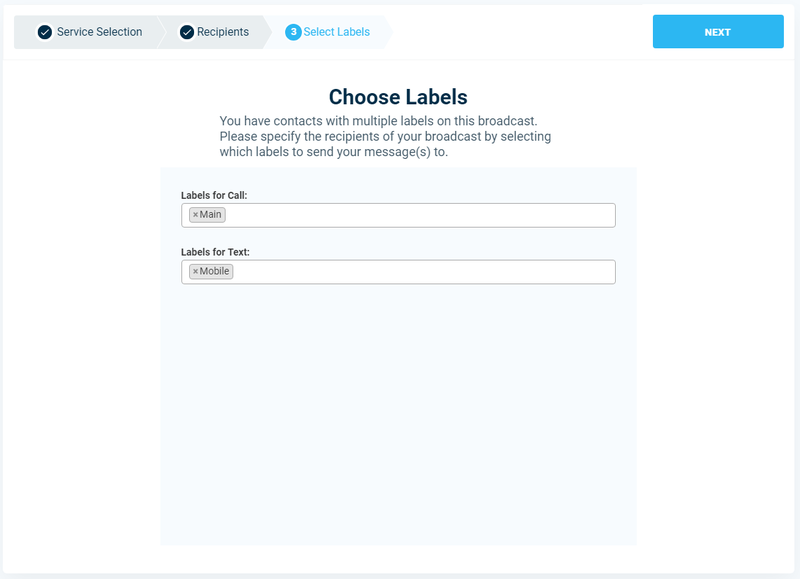 This is where you will select the labels that will receive your phone call, text message and/or email broadcast – multiple labels are able to be selected for each type of broadcast. Above Image: Assign the labels you want to receive your broadcast. 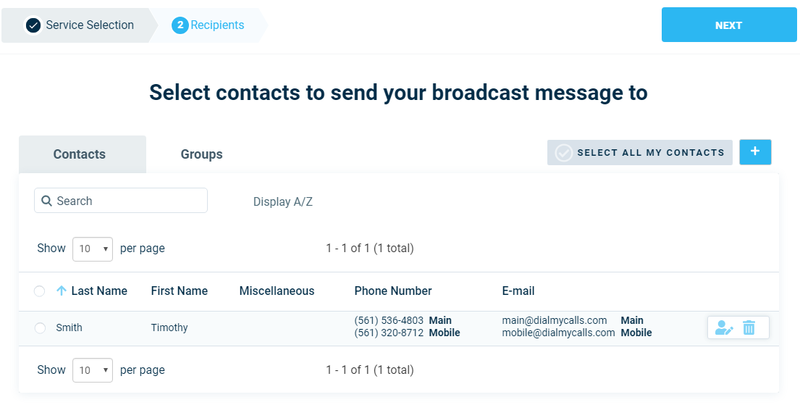 Upon sending out your broadcast to contacts with multiple labels you will be able to check the status of each individual call and/or text that was sent out. 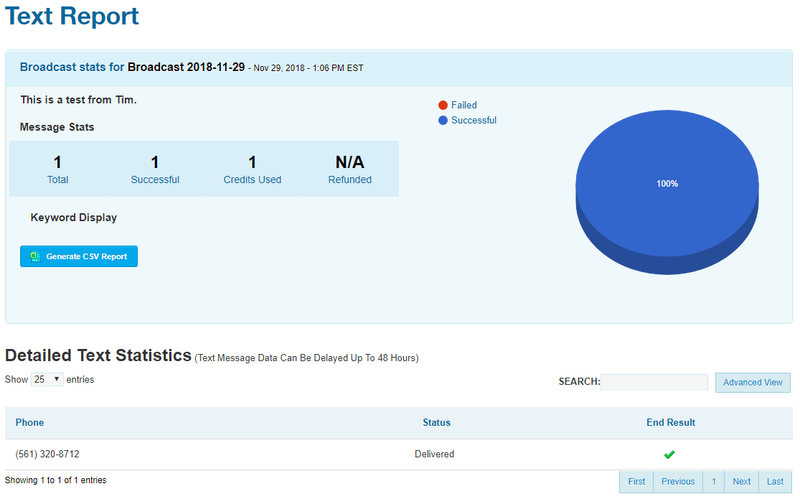 From within your DialMyCalls account click on “Reports” and then you will see every broadcast that has been sent from your account once they are completed – click on the broadcast name to view the detailed report. Above Image: Check detailed reports to see the status of every number called or texted. 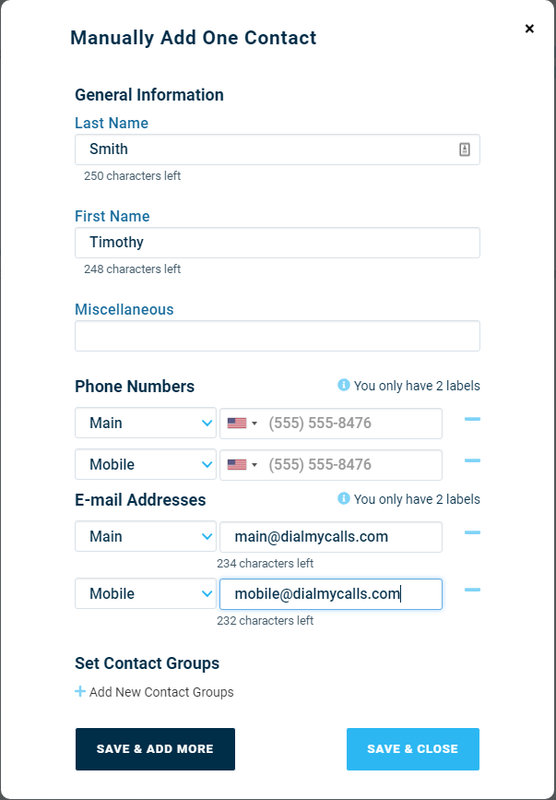 With the launch of DialMyCalls 3.0, customers now have the ability to add multiple phone numbers and email addresses to a single contact. Our brand new “Contact Labels” system is available by request only – please ask to have it enabled on your new account if you feel you’d benefit from it. If you have any additional questions, please contact us for more information.